Recently, the Hog Roast Barnsley team were hired by a corporate client for their private event. The team were hired by a company, the Lifetime House, who were located locally to the Hog Roast team. The event was arranged by Lucie from the company who was arranging a work’s party for the company’s staff. The company chose the Hog Roast Barnsley team’s Corporate Menu One to serve a their events. 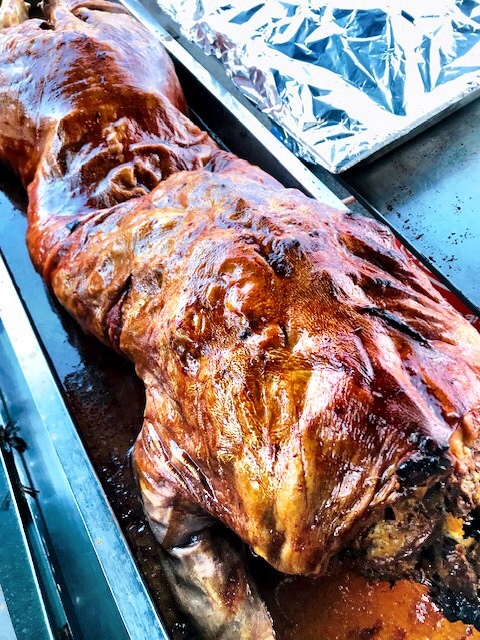 The menu put a fantastic traditional hog at the centre of the buffet table which had been cooked onsite by the Hog Roast Barnsley team that day using a professional Hog Master Machine. The slow roasted hog was served alongside all the classic trimmings including homemade stuffing, crispy cracking and traditional apple sauce. Moreover, in addition to the slow roasted hog, the Hog Roast Nottingham team served vegetarian skewers as the alternative option to the meat which consisted of grilled vegetables and halloumi. The meats were served with bread rolls to enjoy a casual atmosphere at the event. The buffet was served to 60 people, a great size for the Hog Roast team. 50 of the guests were to be served the traditional hog roast while the team made enough vegetable skewers for the 10 vegetarian guests. They served the food at 5pm so it vital that everyone received sufficient amounts of food as the buffet provided the guests’ evening meal. In addition, Lucie requested for chips to be added to the menu to encourage the informal atmosphere. The service was led by the Hog Roast Barnsley team’s Head Chef, Jon, who ensured that all of the food met the high standards that the Hog Roast team uphold. The team were complimented on their friendly service and all of the guests appeared to love the food. The Hog Roast team ensured that there was plenty of food to go around and that the meat was perfectly cooked. In addition, the event demonstrated the team’s flexibility by their ability to add extra items to their buffet tables on the request of their clients. Overall, the evening was a fantastic success for both the team and the company.